These are two terms that get used quite often when talking about hardware switching platforms (i.e. 6500/7600). As you all know, VLAN is a virtual LAN defined initially for L2 bridging. One VLAN represents a broadcast domain and packet forwarding within the same VLAN is based on mac-address learning. Another name for this is multipoint bridging (you'll meet that term quite frequently in ES/ES+ setups). VLANs are also used in the 802.1q ethernet encapsulation method. Services like L2 point-to-point are usually using this functionality. Such services, as EoMPLS xconnect or local-connect (more on that on another post about ES/ES+), do not require a VLAN for bridging, but they might require a vlan as a packet encapsulation method. Global VLAN resource is per system and is limited to 4094 (0 & 4095 are reserved) on 6500s/7600s (you can use "sh platform hardware capacity vlan" to check this). Access VLAN resource is per linecard and is limited to 16000 on the ES/ES+ cards (probably lower on some SIPs), which equals the number of service instances supported. L3 services are a different story. Each physical/logical L3 interface requires a global VLAN resource (use "sh vlan internal usage" to find these). An exception on this are the PPP and ISG sessions (supported on SIP-400 cards). Bridge-domains require also a global VLAN resource each. A bridge-domain, which is used in the ES/ES+ cards, is like a traditional L2 bridging instance, where many physical or logical ports connect to. What is interesting about this, is the ability to have L2 interworking between normal switchports, EVC service instances, ATM/FR PVCs/DLCIs, EoMPLS/VPLS VCs, etc. Although it might seem a little bit confusing, VLAN resource is somewhat independent of VLAN significance. i.e. in a case of a L3 subinterface, you always require a global VLAN resource, regardless of the linecard used. But whether you'll have local VLAN significance or not depends on the linecard itself. SIP-400 and ES/ES+ cards support local VLAN significance, but keep in mind that the "older" ES cards do not support it when using single-tagged subinterfaces. With the "recent" addition of the ES/ES+ cards (although some SIP cards might belong in the same category), 7600 can now support 3 types of EoMPLS configurations . Depending on your needs and the available hardware, you will find at least one between them that can help you implement your network design. This is the most well-known EoMPLS that is configured under a physical interface or subinterface using the xconnect command. Label imposition/disposition is being done by either the SUP's PFC or the ingress module's DFC, so it's supported on all the usual LAN (i.e. 67xx) cards. You can use it for point-to-point L2 services between single attachment circuits, where you do not require any local switching or mac-address learning. Each local attachment circuit uses a single EoMPLS pseudowire to connect to a single remote attachment circuit. This EoMPLS is configured under a vlan (SVI) interface using also the xconnect command. Label imposition/disposition is being done by the egress module (where the EoMPLS VC points to), so it must be either a SIP or an ES/ES+ based one. Also there is a limitation that you must have a L3 (sub)interface as the egress interface where the EoMPLS VC will pass through. You can use it for point-to-point L2 services between multiple attachment circuits, where you also require local switching and mac-address learning. It's like a mini VPLS implementation, where multiple local attachment circuits use a single EoMPLS pseudowire to connect to multiple remote attachment circuits. This new EoMPLS is configured under an EVC service instance using again the xconnect command. Label imposition/disposition is being done by the ingress module where the service instance is configured, so a module with EVC support (i.e. ES/ES+) is required. You can use it for point-to-point L2 services between single attachment circuits, just like the PFC-based EoMPLS. 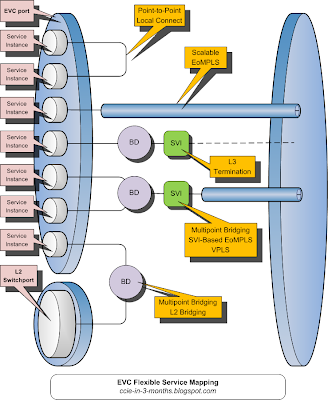 Besides that, when dealing with EVCs you can also configure the xconnect under a vlan (SVI) interface (when the service instance is mapped to a bridge-domain) for point-to-point L2 services between multiple attachment circuits, where you can also enable or disable local L2 connectivity using split-horizon. Both EoMPLS configurations can be used concurrently on the same physical port, with less global resources (i.e. vlans) used in comparison to the first two EoMPLS types. Keep in mind that you still need a SIP or an ES/ES+ egress module for the SVI-based EoMPLS. 1) The vlan configured in "encapsulation vlan-id" under the service instance is local significant. The vlan configured in bridge-domain is a global vlan-id and can be different from the first one. 2) Scalable EoMPLS doesn't require global VLAN resources for the EoMPLS xconnect. In PFC-based EoMPLS each (sub)interface requires one global VLAN resource. 3) An attachment circuit (AC) is usually the customer connection to a service provider network (CE-PE). An AC may be a physical or virtual port/circuit and may be any transport technology, i.e. Frame Relay DLCI, ATM PVC, Ethernet VLAN. Trying to boot manually from the rommon didn't have any positive result, because after the boot was completed (and you were given about 10-20 secs of CLI access! ), the RSP crashed again. Since rommon doesn't provide a way to view crashinfo files, you're stuck with the crashes, trying your best at various guesses. The cause of the crash is that the Pinnacle ASIC failed to synchronize. This is usually caused by a bad contact or a badly seated card. The system recovers without user intervention. If the error message recurs, then reseat the concerned line card or module. Why couldn't the RSP print an error message (after 3 crashes) on the console while in IOS and sit there waiting for the user to act? What benefit does this specific crash and return to rommon offer? I understand that generally a crash/reload is used to force the device recover from a bad situation and possibly avoid a long downturn situation. In my case, the situation was a bad contact or a badly seated card (although there is lot of arguing that can be done here). How was the reload supposed to solve this? Was the reload going to "reseat" the module somehow? Are there any pins moved while reloading? Does rommon offer a better seating? After all, as it proved out the crash didn't help at all, because the RSP returned to ROM, sitting there and waiting, while it could stay in IOS, which provides much better feedback to the user. On the other hand, it's the redundancy factor. Which, imho, is the only case that a crash/reload should occur (i'm still referring to the case of a badly seated module). As long as you have a 2nd working RSP, it should take the active role. But the system knows whether you have a redundant setup long before giving you the CLI prompt, so it should be easy to check upon it. What i'm trying to say is that a crash followed by a reload is not always a panacea in case of a problem. It should be an option used, only when there is no other solution. In case of a badly seated module, crashing and moving into rommon isn't of any help (at least until rommon gets upgraded to something more intelligent). The last 2 months i've been busy playing with an ASR1000, finding bugs and "fighting" with the BUs. Dealing with a lot of issues lately (not necessarily of ASR's), there are a few times that i have come across Cisco's motto "this behavior is expected". One of them was the fact that the very useful functionality of archive config logger (Configuration Logging) is ruined by the inability to filter out per-user configs applied through an aaa server. The Configuration Change Notification and Logging (Configuration Logging) feature allows the tracking of configuration changes entered on a per-session and per-user basis by implementing a configuration log. The configuration log tracks each configuration command that is applied, who applied the command, the parser return code for the command, and the time the command was applied. If you happen to have a router that is acting like a bras, accepting ppp sessions and using radius attributes in order to apply per-user ACLs and/or routes, then you'll find out that the above feature is totally useless, because all these per-user entries are stored into the archive logging buffer, overwriting the actual configuration changes you want to watch (when the configuration log is full, the oldest log entry will be removed every time a new entry is added). According to Cisco's cli help, only changes to the running config, not the one stored on nvram, are to be logged. If you issue the "show run" command (which is supposed to display the running configuration), you won't see these per-user config changes. That's because all these per-user configs, after being downloaded from the aaa server, have a flag set that they should not be nvgen'ed. So they are not shown. In the Cisco IOS software configuration model, the configuration state is maintained in a distributed manner, with each component storing its own configuration state. To retrieve configuration information, the software must poll every component to collect the distributed information. This configuration state retrieval operation is performed by a process known as nonvolatile generation (NVGEN), and it is used by command line interpreter (CLI) commands such as show running-configuration, write memory, and copy system:running-configuration to display or copy the running system configuration. When invoked, NVGEN queries each system component and each instance of interface or other configuration objects. A running configuration file is constructed as NVGEN traverses the system performing these queries. •Only complete commands input in a configuration mode are logged. •Commands that are part of a configuration file applied with the copy command are not logged. The Configuration Change Notification and Logging feature tracks changes made to the Cisco IOS software running configuration by maintaining a configuration log. This configuration log tracks changes initiated only through the command-line interface (CLI) or HTTP. Why Cisco chose to include these per-user "dynamic" config changes into the archive logger, making it another thrown-away feature, is still a mystery to me. There is also the possibility that this kind of continuous logging might be causing a little increase in cpu usage too. Yep, time for another Cisco-should-have-fixed-it-in-the-first-place PER.